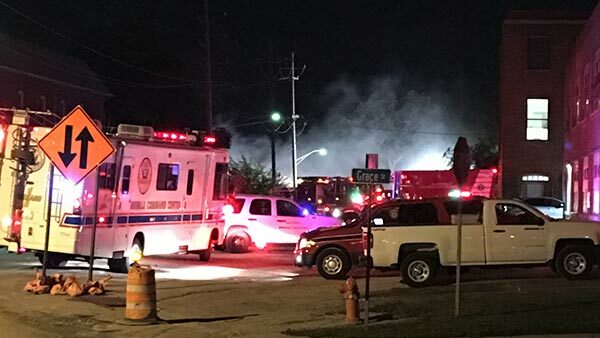 ELGIN, Ill. (WLS) -- A firefighter was injured in a large warehouse fire in northwest suburban Elgin that had crews working for hours overnight, officials said. Firefighters arrived at the abandoned warehouse and office building in the 800-block of Raymond Street around 6:45 p.m. Wednesday. They found smoke pouring out of the roof and windows. A witness who lives nearby said crews from the South Elgin and Hanover Park fire departments also responded to the scene. Due to the extent of the fire and how the structure was built, a demolition crew was brought in to take down part of the building to help firefighters put out the flames, officials said. The blaze was extinguished by around 10:45 p.m.
One firefighter was treated for minor injuries at Sherman Hospital and later released. Fire officials said the building had been vacant for years and the owner was planning to demolish it over the winter.